Does it get much better than Richard Yates? I’m not sure that it does. That’s certainly my feeling after rereading his 1976 novel, The Easter Parade. According to the quotes at the beginning of the book, Joan Didion considers it to be Yates’ best novel, and I can understand why. It’s a desperately sad story, one that taps into a familiar theme in this author’s work: the search for happiness and fulfilment that always seem to elude his characters. Despite the deep sense of sadness running through the novel, this is a wonderful book. It has left me keen to read more of Yates in the future. The Easter Parade follows the lives of two sisters, Sarah and Emily Grimes, from their childhood through to middle age. Neither of the sisters seems destined to live a happy life, and the novel makes this clear from the opening line. By 1930, their parents are divorced, and the girls go to live with their mother in a rented house in New Jersey. The mother, Pookie, is a bit unstable. She aspires to belong to a higher social class, to live in a bigger and better house. Just as the girls get settled in one home, Pookie insists on moving them to another. In short she is constantly seeking the finer things in life. The girls have a somewhat idealised view of their father, a copy-desk writer for the New York Sun newspaper, whom they visit every now and again. He dies young from pneumonia although there are hints of a reliance on alcohol and cigarettes which may well have contributed to his death. The focus of the story is the different paths the two girls follow in their lives, each of them yearning for happiness, neither of them finding it within their grasp. Sarah is four years older than Emily. As a young woman, she is curvy, attractive and her father’s favourite. Keen to get married and settle down, Sarah marries Tony, a well-educated, handsome young man with the look of Laurence Olivier about him. They go to live in a country cottage within the grounds of Tony parents’ estate in St. Charles, Long Island. Three sons follow within the space of a few years. On the surface, everything appears rosy, but as this is a Richard Yates novel, we know that’s not going to be the case here. By contrast, Emily’s life follows a more independent route than that of her sister. Emily is tall, rather flat-chested and perhaps a little plain compared to Sarah. There is a sense of vulnerability about Emily’s character. At first she appears somewhat self-conscious, especially in the shadow of her older sister, but as the years slip by she grows in confidence. The novel focuses on Emily, so we see most of the story from her point of view. She gains a scholarship to Barnard College and her education enables her to find work as a librarian, a journalist, and ultimately as a copywriter in an advertising agency. At Barnard, she meets and marries a philosophy grad assistant named Andrew. The marriage, however, is a disaster – blighted by Andrew’s bitterness over his impotence – and so the couple separate within a matter of months. While working on the editorial staff of a trade journal, Emily falls for her editor, a divorcee and published poet named Jack. They move to Iowa when Jack lands a role teaching at a writer’s workshop at the university there. At first everything seems to be going well, but as Jack struggles to complete his next book, everything starts to fall apart. A holiday to Europe turns sour leaving Emily feeling more alone than ever before. During the years that follow, Emily goes from one doomed relationship to another, forever seeking the love and companionship of a stable partner. While she continues to hope things will finally come together, there is occasionally a feeling of relief if they don’t. As the cab pulled away she turned around in the heavy scent of roses to see if he would wave, but she caught only a glimpse of his back heading into the sidewalk crowd. As the years pass, the sisters drift apart. While Emily grows increasingly lonely, cracks begin to appear in Sarah and Tony’s marriage. When Emily meets her sister for lunch in town one day, she finds her much changed. Sarah appears so much older than her forty-one years, her faced lined and shadowed, her hand permanently clutching a glass of martini. At first, Sarah is keen to maintain appearances – she pretends everything is okay, resorting to drink as she attempts to wipe away the reality of her life with Tony. By the evening, however, it becomes clear that she is the victim of domestic abuse. In a particularly painful scene, Sarah calls her sister from a hotel; when Emily goes to see her sister, she urges her to leave Tony. The underlying tragedy of these sisters’ stories is that they each crave a little part of what the other one has in her life and yet they seem unable to share their true feelings with one another. In her younger days, Sarah aspires to be a writer, but her promising start in putting together a book of letters falls by the wayside; her duties as a wife and a mother must come first. Sarah envies her sister’s independence, and yet she is unable to break free from Tony even though she knows her situation is likely to deteriorate even further over time. Emily, on the other hand, longs for a different type of fulfilment: the stability of a permanent relationship. Not quite the type of marriage that Sarah has made with Tony, but something more loving, more caring. Update: Kim (at Reading Matters) and Carly (guesting at tomcat in the red room) have also reviewed this novel – just click on the links to read their excellent reviews . 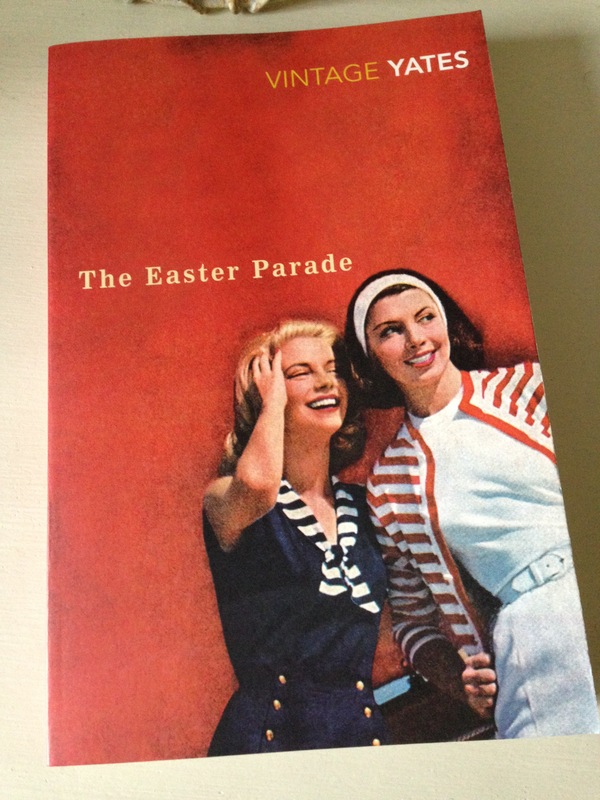 The Easter Parade is published by Vintage Books. Source: personal copy. Book 17/20, #TBR20 round 2. This entry was posted in Book Reviews, Yates Richard and tagged #TBR20, Book Review, Fiction, Richard Yates, US, Vintage Books on December 1, 2015 by JacquiWine. I loved Revolutionary Road as well. That’s where I started with Yates just before the Sam Mendes film was released six or seven years ago. Yes, the focus on women was one of the aspects that drew me towards The Easter Parade in the first place. I first read it back in 2009 (virtually straight after finishing Rev. Road! ), and I’ve been meaning to reread it all year. I think the prompt to revisit The Easter Parade came from Joan Didion’s quote in the blurb – she loves this book and considers it his best novel. I was very taken with Didion’s debut novel (Run River) when I read it earlier this year, and its tone reminded me of the Yates. Both books share a similar sense of sadness. The Easter Parade is a little different to Revolutionary Road – less dramatic perhaps, but I think it’s my favourite of the two. I read and reviewed this one years ago and by coincidence I extracted it from my shelf last night to give to a friend to read today. I have very fond memories of reading it: I do love a bleak melancholic novel! It’s the only Yates I’ve read… Can you recommend others? What a coincidence! I’m rather drawn to these sad stories, too – anything with melancholy or elegiac tone tends to appeal to me. Thanks for letting me know that you’ve reviewed this one, Kim – I’ll head over to yours to take a look. This is only the second Yates I’ve read, but I can strongly recommend his debut novel, Revolutionary Road. It’s a devastating portrayal of the disintegration of a marriage and thwarted dreams – I think you’d like it very much. I haven’t read this one, thank you for recommending and reviewing it so thoroughly, Jacqui. I tried Yates years ago but didn’t really get on with him for some reason. However, your excellent review rather makes me want to give him another go…! I think it’s worth trying again with Yates. Maybe the timing wasn’t quite right for you? (His work is rather melancholy.) Which one did you try? I had previously heard a lot of good things about this book. This book sounds like the characters are tied into such an interesting symmetry. I like the way that you described this in your review. I like the writing of the quotes that you posted. It seems matter of fact but still seems like it contains a lot of meaning. Thank you. The symmetry and contrasts between the two characters really stood out to me. Each sister yearns for something the other one has in her life (or at least a different, more idealised version). The characterisation is excellent here – there’s a lot of stuff going on in the background that I haven’t even touched on in my review. I love way Yates writes. As you say, it seems quite direct and matter of fact on the surface, but he has the skill to create something very profound. This seems like a good “sisters” novel with which to follow up Cassandra at the Wedding. I read it many years ago – after its brief but significant mention in Woody Allen’s Hannah and Her Sisters – but had almost completely forgotten it until your lovely review brought it back. I should give Yates another try – maybe just read this one again. Gosh, I hadn’t even thought of a possible comparison with Cassandra at the Wedding until you mentioned it in your comments! It would make an interesting contrast with Baker’s novel that’s for sure. I found Emily and Sarah’s story very sad, though…more so than Cassandra and Judith’s. Funnily enough, the other novel that came to mind was Joan Didion’s Run River. I couldn’t help but think of Lily as I was reading The Easter Parade for the second time. As for the Woody Allen reference, it’s been such a long time since I last watched Hannah and Her Sisters that I’m struggling to recall the relevant scene! It’s high time I dusted off the DVD for another viewing. The title reminded me of a very happy Easter song that my husband sings (rather off-key) every Easter Sunday. Now I can’t get rid off the association, even though the book sounds so melancholy and sad. I haven’t heard of this book before, but I own Revolutionary Road, so I will use that as an introduction to Yates. Haha! I always think of Easter as a happy occasion – the beginning of spring, the warmer weather, not to mention all that chocolate. Yates’ novel is pretty much the exact opposite of that image, although Sarah and Tony do have an enjoyable day at the Easter Parade when they are young and still in love with one another. Revolutionary Road was Yates’ debut, so I think it would make a great introduction to his style. I really hope you like it. You’re very welcome! I loved Revolutionary Road as well, but I think The Easter Parade might be my favorite of the two. It’s such a sad story, full of emotional depth and meaning – I’m so glad I picked it up again. I’m so pleased that Joan Didion regards it as his best novel as I’ve always preferred it to Revolutionary Road. I discovered Yates at the same time he was ‘rediscovered’ in the UK just over 10 years ago and all his work was reprinted. With only seven novels, there’s no excuse not to read them all! It’s interesting, isn’t it. Revolutionary Road is a brilliant novel, but I think I prefer The Easter Parade as well. It’s a little quieter than RR, more introspective, perhaps. I think I discovered Yates just before the release of the film adaptation of Revolutionary Road. A friend selected the novel for our book group, and I loved it from the opening page! It sounds as though you’ve read them all, Grant. Do you have any other favourites? I’m wondering which one to read next (and whether to save one or two for ‘best’). I didn’t realize Easter Parade was a sad book – it sounds so happy. But, I suppose if it’s by the same author who wrote Revolutionary Road, it’s not surprising. I do love to read about sisters (even sad ones)! Yes, the title creates the impression of a happy occasion, but I wonder if that was a deliberate move on Yates’ part. His work seems to highlight the illusion of the American Dream – in many ways that idealised image is just a facade, a veneer that hides the underlying reality of life. I loved the way he focused on the two sisters in this novel – it made for a very interesting comparison. Good point, Jacqui. So true! Awesome stuff. This, Revolutionary Road & Young Hearts Crying are the only Yates’ books I’ve read. My friend Carly reviewed this one on my own blog a few years ago (http://tomcatintheredroom.com/2011/06/16/sad-veiled-bride-please-be-happy-the-easter-parade/). Thank you, and cheers for the link to Carly’s review – I’ll be heading over to yours very shortly to take a look! I’ve reviewed at least a couple of Yates at mine, but not this one which I own (unsurprisingly, I own all of them). You make it sound excellent, and yet I may wait a bit as I was always disappointed I’d read Revolutionary Road first and so perhaps left myself with nowhere to go but downhill having read his best. If this is also perhaps a best, I may want to save it a bit until I’ve read some of the others, particularly since I doubt he had a bad book in him so not his best is still better than most. Simon’s mention of Toibin is interesting, there is a subtlety to both. Oh, great – thanks, Max. I’ll take a look at your Yates archive (it might be later this week, but I’ve made a note). Good thought about keeping one or two of his best novels in reserve. (I’m trying to do the same with Edith Wharton by keeping The Age of Innocence and Custom of the Country for a little while – I suspect they might be her best works.) As far as I can tell, The Easter Parade is widely considered to be one of Yates’ best so you might want to sit on it for a few years. I first read it virtually straight after finishing Revolutionary Road and if anything I think I preferred The Easter Parade. I’m splitting hairs here as both novels are superb, so maybe it’s a question of personal preferences. Yes, an interesting comparison with Toibin. You know, I was struggling to think of another male author who could write women with the depth of insight Toibin brings to his work. Having reread The Easter Parade, I think Yates could be in with a shout on that front. His portrayal of the two sisters is wonderful here. I think because I’ve seen the RR film this one appeals the most. Completely agree with you about how good Yates is. Another of those writers who died away from public view for a long time. I would see John Williams’ “Stoner” as being in this tradition. Yes, a wonderful writer and it’s great to see his novels back in print after all this time. Stoner is a good comparison, another ‘rediscovered’ modern classic. Wallace Stegner springs to mind as well, although he’s a little more recent and arguably better known than Williams (prior to the latter’s resurgence). I loved Stegner’s Crossing to Safety. This has been ‘my next Yates book’ for a while now. I actually bought a physical copy a couple of weeks ago so a reading should be imminent. The book has a killer first line and the Vintage version has a great cover. Hurrah! I hope you enjoy it. Yes, the first line is quite something, isn’t it? Funnily enough, I used that very description (a killer line) when commenting on Kim’s post as she quoted the opening in her review. I very much hope you’ll review The Easter Parade, too – I’m looking forward to discovering what you think of it. The Vintage covers are superb, aren’t they? I wouldn’t mind owning the full set. Sounds like something to really get your teeth into. Luckily, I already have a copy. I read Revolutionary Road, my first Yates, this August and loved it. Yates’ characterization, especially of Frank Wheeler, is masterful. I’ve heard that the rest of his works have a samey feel so I haven’t been searching out his other novels. But the plot of The Easter Parade seems different to Revolutionary Road so this might be my second Yates. I just need to find it now. Revolutionary Road is the only other Yates I’ve read (so far), and it really struck a chord with me too. I think the story behind The Easter Parade is sufficiently different to make it a good ‘next step’ in reading his work. It’s a little quieter and more introspective than Rev, Road, but once again the portrayal of the central characters is top notch. I hope you manage to track it down. Oh, that’s great to hear. Revolutionary Road is such a brilliant novel…quite astonishing for a debut. I really hope you get a chance to read The Easter Parade next year. It’s a little different to Rev. Road, so it would make for an interesting comparison. I’m keen to read Richard Yates (I have Revolutionary Road and Young Hearts Crying on my shelves!) but I keep waiting for a sunny day and a good mood. But then I think, why spoil a sunny day and a good mood with literary devastation? So it’s tricky to find the right moment for him. But he’s a phenomenon and I would very much like to read one of his novels one of these days, sunny or otherwise. Lovely review, Jacqui! Yates was way ahead of his time and this sounds another “Great American Read”. Have you read any A M Homes – I’m sure she follows in the grand tradition of people like Yates. Thanks for dropping by, Tom. Yes, I’m glad Yates was ‘rediscovered’ some eight or so years ago. It’s great to see these novels back in print with such beautiful Vintage covers. I’ve read a couple by A.M. Homes – This Book Will Save Your Life and May We Be Forgiven. I like the way she uses humour in her writing to bring out the dark comedy in family life. Yes, exactly! Emily reminded me so much of Didion’s Lily from Run River – both of these novels share a similar sense of sadness. I think it would be a good one for discussion as well. Funnily enough, I met up with a friend just the other week and her mother, who was also visiting at the time, had just finished reading it for her book group. I don’t know if you’ve read anything else by Yates, but having loved this and Revolutionary Road, I’m really keen to try more of his work. What a wonderful review Jacqui – thank you. I like the sound of this very much, two sisters who both hark a little over each other’s lives (neither of which sound that appealing)… one for the wishlist! Oh, thank you, Cleo. I was so taken with this novel. Yates is a master when it comes to this type of story – he sets the tone very effectively. The Easter Parade is one of my favourite books ever! And Richard Yates is possibly my favourite author, so this review has me all happy in remembering. It’s definitely the best of Yate’s books, I recommend A Good School or Revolutionary Road next. Hurrah! I’m so glad you loved this one as well, Alice. Thanks for the recommendations. I loved Revolutionary Road (that’s where I started with Yates), so A Good School could be next – I’ll check it out. Brilliant review. I missed this post when you published it. This is to date the only Richard Yates novel I have read. I loved it. Such powerfully but subtly explored relationships I must read more by him. Thank you. Yes, I loved the subtlety in Yates’ portrayal of these two sisters. He is a master at this kind of stuff. If you’re looking for another one to try, I can recommend Revolutionary Road. Another devastating story, but once again the characterisation is superb. Loved Revolutionary Road and, if this is as good or better must make space for reading this next year. Good to hear that Yates managed to top his debut as it is a kind of tragedy when your first book is your best, I guess. I suspect many people would still consider Revolutionary Road his best novel, but I think I prefer The Easter Parade. It’s quieter, more introspective than Rev Road, but the characterisation of the two sisters is superb. I loved it – well worth getting to sooner rather than later. I think I’m going to try his short stories next as the Eleven Kinds of Loneliness collection has been on my bookshelves for quite a while! Glad to hear it – I think he’s a wonderful writer.